the UGC: Who Knew I Could Say So Much About a Condiment? Who Knew I Could Say So Much About a Condiment? I'm going to come right out and say it. I don't really like ketchup. I know. What's not to like? I just, I dunno. I don't mind a little on my hamburger, but if the french fries I ordered are any good, I don't want any ketchup near them (ranch dressing is another story). If the fries are pretty mediocre, I might dip a few in a little ketchup, but eh. I can still do without. Most of the time, I don't think it's really adding that much to whatever I'm eating. Since the boy fiance is the ketchup fan around here, he's in charge of making sure we're stocked up. 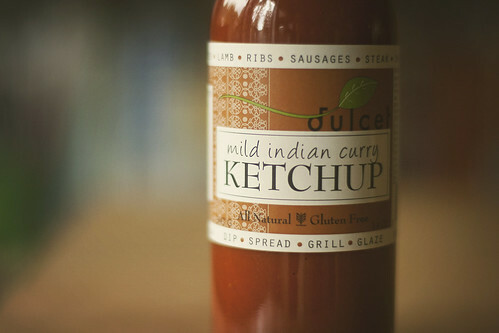 So when he brought home a bottle of the mild indian curry ketchup in the photo above, I didn't think much of it. More ketchup. Whatever. A few days later he made lunch and without asking he put some of the curry ketchup on my plate. "It's really good with the sweet potatoes," he said. I'm willing to try pretty much anything, so why not a little curry ketchup. I took a few bites and quickly realized, this stuff is AMAZING. I'm hesitating to even call it ketchup. I suppose there's a faint trace of it there, but what I mostly taste is the curry, which is very mild and not spicy at all and wouldn't you know, it tastes good with SO MANY THINGS. It was great with the sweet potatoes and I bet it's even better with sweet potato fries (haven't tried this yet, but I will soon). But the thing that totally won me over was pork. My step-mom had given me some left over pulled pork from a family gathering and she even gave me some barbecue sauce to go with it. I'm not a huge barbecue sauce fan either (yeah, I don't know what my problem is), especially if it's store bought. So when I was heating up the leftovers, I grabbed the bottle of curry ketchup and used a little of that instead. I knew this stuff was good, but I wasn't expecting to want to eat all the leftovers right then and there. I guess all it takes is adding a little curry to some ketchup to make me a fan. So where can YOU get some? I found my bottle at Whole Foods, but you can order it from the Dulcet site, or over on Amazon . I know they have other flavors, but I like this one so much, I don't think I want to try the others. And as an added bonus, it's gluten free! It's the perfect condiment, if you ask me. \n\n\nI'm going to come right out and say it. I don't really like ketchup. \n\nI know. What's not to like? I just, I dunno. I don't mind a little on my hamburger, but if the french fries I ordered are any good, I don't want any ketchup near them (ranch dressing is another story). If the fries are pretty mediocre, I might dip a few in a little ketchup, but eh. I can still do without. Most of the time, I don't think it's really adding that much to whatever I'm eating.\n\nSince the boy fiance is the ketchup fan around here, he's in charge of making sure we're stocked up. So when he brought home a bottle of the mild indian curry ketchup in the photo above, I didn't think much of it. More ketchup. Whatever. A few days later he made lunch and without asking he put some of the curry ketchup on my plate. \"It's really good with the sweet potatoes,\" he said. I'm willing to try pretty much anything, so why not a little curry ketchup. I took a few bites and quickly realized, this stuff is AMAZING. \n\nI'm hesitating to even call it ketchup. I suppose there's a faint trace of it there, but what I mostly taste is the curry, which is very mild and not spicy at all and wouldn't you know, it tastes good with SO MANY THINGS. It was great with the sweet potatoes and I bet it's even better with sweet potato fries (haven't tried this yet, but I will soon). But the thing that totally won me over was pork.\n\nMy step-mom had given me some left over pulled pork from a family gathering and she even gave me some barbecue sauce to go with it. I'm not a huge barbecue sauce fan either (yeah, I don't know what my problem is), especially if it's store bought. So when I was heating up the leftovers, I grabbed the bottle of curry ketchup and used a little of that instead. I knew this stuff was good, but I wasn't expecting to want to eat all the leftovers right then and there. I guess all it takes is adding a little curry to some ketchup to make me a fan.\n\nSo where can YOU get some? I found my bottle at Whole Foods, but you can order it from the Dulcet site, or over on Amazon . I know they have other flavors, but I like this one so much, I don't think I want to try the others. And as an added bonus, it's gluten free! It's the perfect condiment, if you ask me.